Before working with Michael Schenker and getting Japanese Record Deal, Amy Schugar had been developing her skills as a songwriter, arranger, singer and guitarist. Amy seemed to come from a musical background from the start. Her God Mother is the very famous Amalia Mendoza and her Mother was a famous Bullfighter in the 50's and singer named Carla Lee. Carla Lee is also featured in a book called "Women and the Bullring" by Murial Feiner. A chance meeting with Mr. Schenker (UFO, Scorpions, MSG) while attending an Eric Johnson Concert Amy was noticed by Mr. Schenker as she was singing and playing Eric's 57-59 Stratocaster on the side of the stage. Michael was impressed with what he heard and saw, and the two began their songwriting collaboration. The duo recorded the album "Under Construction", featuring Schenker's soulful guitar playing and Amy's magical voice. The Recent Release is Sold in Japan and signed on Avalon Records and includes a bonus track. The album can also be found on Amy's Home Page at http://Amyschugar.com and on CD BABY. Amy was a special guest with MSG on a Fall/Winter�tour, playing songs of Michaels/MSG, while showcasing Amy's guitar skills and the Schugar/Schenker album. 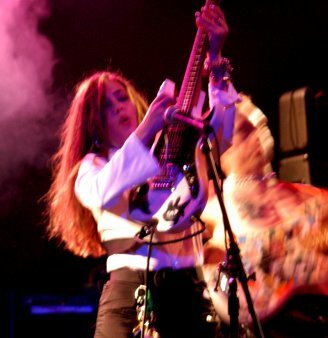 Amy has received many endorsement deals with great companies like Bestelectronics GuitarCable.com, Floyd Rose Tremolo Systems, D'Addario Strings, Crate Amps, Seymour Duncan, Fernandez Sustainer's and Robert Keeley Electronics , Daisy Rock Guitars and is featured in countless music trade magazines and internet webzines. Amy got great Interviews in GUITAR PLAYER MAGAZINE and BURRNS MAGAZINE of Japan. Amy continues to write songs consistent with her bluesy melodic Rock and Roll style. Her band is a rare Female Fronted Rock Power Trio. Much More information and Press reviews / interviews can be found on her home page at http://Amyschugar.com, http://Amyschugar.com/reviews.php along with the album.